(BFVM) is a 501 (c) (3) non-profit organization, was formed in 1997 and is currently in its 22nd season. BFVM is dedicated to preserving and enhancing the beauty of authentic Mexican folklorico dance and sharing this art form with the general public. BFVM is a member of the United Corpus Christi Chamber of Commerce, the greater Corpus Christi Hospitality Association, and the Westside Business Association. BFVM regularly participates in Buc Days activities, Diez y Seis de Septiembre, Dia de Los Muertos, and Cinco de Mayo celebrations. The group often performs at other civic and charitable events. At the end of each dance season, BFVM offers an evening performance of traditional dance and music. BFVM is under the artistic direction of Maestra Cinthia Arredondo. Maestra Cinthia, is a licenciada de Danza Folklorica Mexicana from the Universidad "Escuela Superior de Danza Folklorica Mexicana C'ACATL" (Edo. De Puebla). 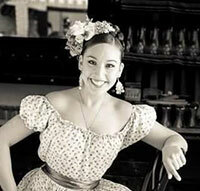 Until 2014 she danced professionally with the Ballet Folclorico Nacional de Mexico de Silvia Lozano. Her performances have taken her throughout the Mexican Republic, Colombia, Italy, France and the United States. Her area of study is extensive from Aguascalientes to Zacatecas and everything in between. BFVM is available to provide entertainment at weddings, quinceaneras, anniversaries, and other special occasions. Call (361) 994-8274 or email vanzante@stx.rr.com for more information.